QUALITY MATERIALS - You'll be able to adjust height, tilt tension, and swivel 360º thanks to the quality-tested pneumatic gas lift and tilt/tension mechanism. 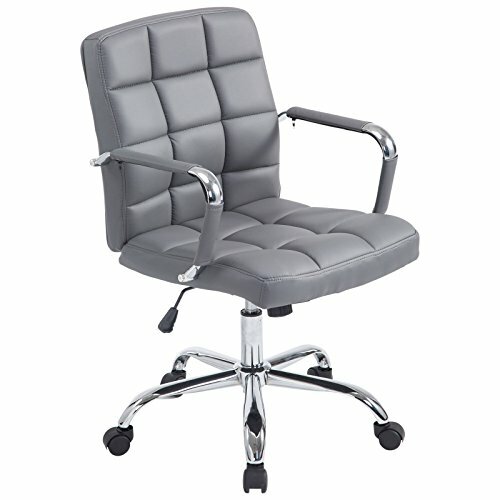 A chrome-coated steel frame and removable arms and a 5 star Cast Aluminum base make the Manchester Office Chair sturdy, and the soft padded vegan leather material will look gorgeous and last! MID-CENTURY MODERN - Make a statement with an adjustable mid-century style chair that completes the contemporary office space. Inspired by a classic mid-century design, this version shows off a bold and sophisticated presence. The Manchester Office Chair is a stylish choice for the home office or conference room. VARIETY OF COLORS - The Manchester Office Chair is available in the classic black, or you can switch it up with a stunning white, a gorgeous grey, or a beautiful terracotta. There's no limit on possibilities for your space with colors to fit any style room!